is one that cannot be taken lightly. We understand this best and provide the most comprehensive sequence of high quality IVF products. 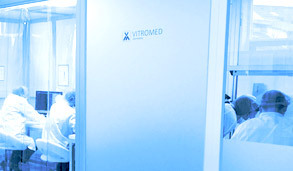 VITROMED is an ISO 13485 certified medical manufacturer of high quality medical grade products in the IVF world. With involvement of IVF veterans and scientific researchers within the field of assisted reproduction and both combined with German precision technology, we have developed a sequence of quality products, ensuring the best results in the whole IVF process. More than business we believe in social commitment. Our greatest asset is our research and development team. With a scientific advisory panel consisting of well-known medical doctors, scientists, embryologists and along-side Engineers, we are focused to maintain highest quality standards and to ensure continuous increase in the quality of our products.